Whether you have plans for an extravagant Thanksgiving feast with the family or a simple “Friendsgiving” with your closest buds, it doesn’t hurt to add a fun game or two to the mix. 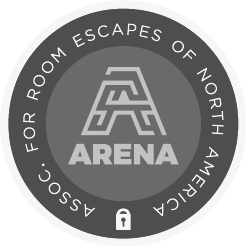 These games are perfect for all ages and all types of groups. Try them for Thanksgiving this year and start a new tradition! Duration: 10-15 minutes, or as long as you want! Benefits: Helps everyone consciously recall all there is to be thankful for! Prepare by painting your chopsticks different colors, making equal amounts of each color (10 of each color). Create your game key. You can either find a printable or simply swatch the paints you used for your chopsticks on a piece of paper and write out the guidelines beside each color. You only need one game key. You can choose your own guidelines or fill in the blank to “Share a(n) _____ you’re grateful for” with any of these: person, place, food, memory, skill, object, event, or anything. You and your guests will circle up and choose one player to drop the bunch of chopsticks so that they fall into a random pile. Like the game Pick Up Sticks, one player at a time will draw a stick being careful not to move the other sticks. If you move another stick, you lose that turn. Otherwise, the color you draw represents which category of gratitude you will share out loud and you may keep that stick. The goal is to collect as many sticks as possible. Continue to go around until either all the sticks are drawn or set a timer to finish. The player with the most sticks wins and if you play this before dinner, maybe the prize could be first dibs on food! 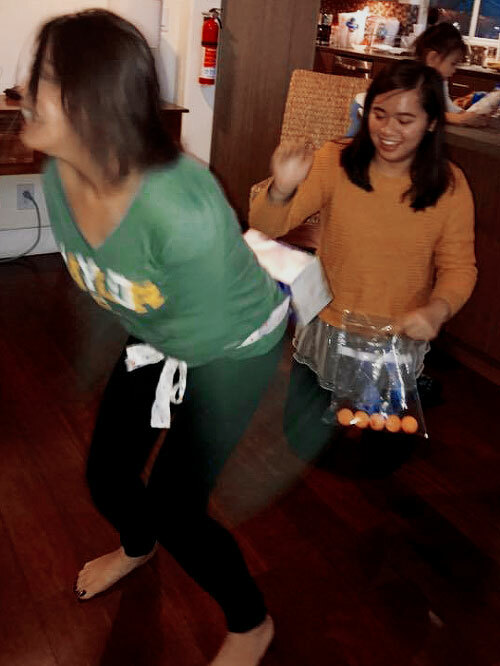 ‍My aunt and sister playing the classic version of this game with ping pong balls. As you can see, sometimes you have to channel a bird in flight to win the game. So much so that your limbs disappear in photographs. Benefits: Cardio workout and a good laugh. Make your tissue box contraption by first removing the plastic cover from the opening. Attach the box to a wide strip of ribbon or fabric by either cutting small slits into the bottom side corners and weaving the ribbon through or simply taping the box to the ribbon. Make sure it’s secure! Fill the box with as many or as little feathers as you like. Have your guests pair up. One player will wear the tissue box while the other collects the feathers in a clear container. Depending on the size of your group, you can have multiple pairs go in one round. Just be sure their tissue boxes face away from each other so the feathers don’t get mixed up. When the timer starts, the player wearing the box must shake, wiggle, and jump to make the feathers fall out of the tissue box. No hands allowed on the box! The player with the container must collect all the feathers as this happens. At the end of one minute, the pair with the most feathers collected (or all if you filled the box with few) wins! You can either count the feathers or if you used a lot, mark the fill level on the container to compare with other pairs. Benefits: Encourages collaboration and communication. Split your guests into two even teams and have them line up side by side, each with chopsticks in hand. Place one bowl full of the food items at one end of the line and an empty bowl at the other end. Once the signal to start is given, the player closest to the full bowl will use their chopsticks to pick up one item at a time and pass it to the player next to them. Players will pass items using ONLY their chopsticks, no touching the food with your hands! If a player drops an item, they will need to bring it back to the starting bowl. But younger children should be allowed to resume where the item dropped. The first team with all 4 items transferred to the other bowl wins!  Thanksgiving is a time to reflect on gratitude and to enjoy the company of your loved ones, and games are a simple and fun way to bring people together, just like we do here at Red Door. Play these games at your Thanksgiving gathering and be thankful that you can at least laugh away some of those calories!